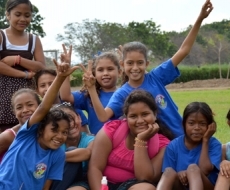 1) There is no other playing field in the community of Limón 1. Very few communities have suitable playing fields where kids can play safely. 2) Most children in the area do not have the equipment required, or any at all, to play sports like baseball, softball, soccer and basketball. These are extra items that most families in Limón and surrounding communities cannot afford. 3) The majority of children’s free play-time is unsupervised and unstructured, putting some kids at risk of developing dangerous habits and participating in delinquent behaviors. 4) Because of the “machismo” culture, it is thought by many that the female’s place in society must be restricted to the home. This social scheme eliminates many opportunities for women and girls of the region, especially when it comes to participation in sports. To combat these issues, we have developed a dynamic and inclusive youth sports program. Here at FunLimón, young athletes have fun while learning that self-discipline, practice and perseverance produce positive results. Our soccer field, baseball field and basketball court are maintained daily so that youth in the area have clean, safe facilities to play. We have set up a sport equipment borrowing system here at FunLimón so that children have access to whatever sport equipment they may need. Our full-time youth sports coach plans out each practice so that the kids constantly improve their techniques and skills. He also acts as important roll model for many of our youth athletes. We offer various co-ed sporting activities each week that are open to any child interested, including basketball, volleyball, and other fun games. We also offer several team sports that compete in local leagues, including softball, baseball and soccer. We always make a conscious effort to offer equal opportunities and strive for equal participation from boys and girls.